More than 20,000 tickets were issued for the event, raising concerns with city officials. Republican presidential candidate Donald Trump rests his hands on his belt as a protestor is removed from the arena during a campaign stop at the Tsongas Center in Lowell, Mass., Jan. 4, 2016. The mayor of Burlington, Vermont, has raised concerns over Donald Trump's campaign decision to issue close to 20,000 tickets for a Thursday night rally at a theater that seats only 1,411 people. Burlington Mayor Miro Weinberger told NBC affiliate WPTZ that he values "robust political debate," but has "repeatedly expressed concern and encouraged the campaign to take steps to better manage the event." “There is still time for the campaign to communicate with the thousands of ticket holders to reduce the possibility of inconvenience or a public safety risk for attendees tomorrow night," Weinberger said in a written statement to WPTZ. "I urge the Trump campaign to take responsible steps to ensure the event proceeds smoothly and without incident." The executive director of the Flynn Center for the Performing Arts, John Killacky said Trump's campaign "oversubscribed the event." Anticipating overflow crowds, city officials said the Secret Service and fire marshal will impose strict attendance limits and turn away those still in line once the center reaches capacity. Police Chief del Pozo told the Burlington Free Press that the Trump campaign informed police to expect about 6,500 people to show up at the theater, adding that the real-estate mogul's staff have refused to accept responsibility for ticket holders who are denied entry. 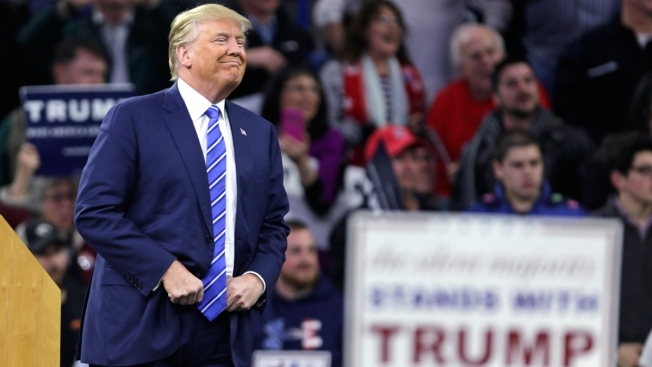 Trump advised ticket holders in a tweet to arrive early for the rally as admittance would be "first come, first serve," and that Burlington officials said "no to outside event and soundsystem." When the GOP frontrunner takes the stage inside the Flynn Center — located across a park from Democratic presidential candidate Bernie Sanders' campaign headquarters — protesters will hold a peaceful vigil followed by "a celebration complete with live music," WPTZ reported. “Ninety-nine percent of the people there are coming to collectively share in a vigil. We're bigger than this, we're not about hate, we're about coming together, solving problems peacefully,” Michele Asch told NBC5. Asch's remarks mirror those expressed by Sanders, the city's former mayor, who welcomed Trump's visit to the Granite state in a statement Friday. "I hope his presence here will help him better understand Vermont values — social and economic justice, tolerance, respect for all people and the environment." Sanders' campaign manager Jeff Weaver emailed supporters Thursday, ahead of Trump's arrival, asking them to show the Republican frontrunner that "a billionaire is no match for our political revolution." Weever also called out Trump for his "dangerous rhetoric," including his controversial statements on mass deportation and banning Muslims from entering the country. "When Donald Trump says that he wants to deport immigrants, or ban Muslims from entering the country, or build a wall at our southern border, show that you stand with Bernie's plan for a humane immigration policy that unites families," the email said. Doors at the Flynn will open at 5 p.m. ET and the rally is expected to begin at 7 p.m. ET.